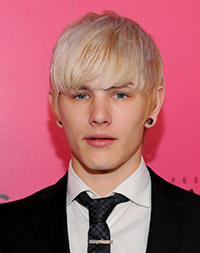 Luke Worrall was born in Croydon, London, England, UK, on December 26, 1989, is a English male model. Luke was discovered while skateboarding in his hometown, London outside Camden train station, by model scout from modeling agency Public Image Worldwide. He dated daughter of Ozzy Osbourne, singer and actress Kelly Osbourne (2008-2010). Luke's hobbies are BMX, skateboarding and playing music, DJ'ing. His favourite movie is British film Quadrophenia (1979). Fan of Sid Vicious and Jonny Rotten. He made his acting debut in short drama film Blinders (2011) in role as beautiful boy. JON Magazine Cover, Boys by Girls Cover, Fiasco Cover, Vanity Teen Cover, i-D Magazine, Tendencias Cover, Bite Cover, The Ones 2 Watch: New Wave, Vanidades Cover, 7TH Man, Sheer Cover, Supplementaire Cover, GQ Style UK, METAL, Candy Cover, Dansk, Blend Cover, Arena Homme + Cover, Dazed & Confused, Vogue Italia, Squint Magazine, Electric Youth, V Man. Armani Exchange, Cacharel Amor Amor Forbidden Kiss Fragrance, Antony Morato, Bjorn Borg, Me + City Winter Asia only, Uniqlo, Juicy Couture, DKNY, Vivienne Westwood. Walked runway for Bobby Abley, Comme des Garçons, Mugler, Marc by Marc Jacobs, Emanuel Ungaro, Neil Barrett. Represented by agencies DNA Models New York, d1 Model Management London, m4 models Hamburg, Bananas Paris. I like to do something that's fun and exciting. I try to be romantic when I can. Modeling has meant a ton of travel and meeting a lot of wonderful people. Favorite food is most likely Nando's it London's best restaurant. I like playing instruments and fiddling with music at home, and DJ'ing. I play mostly deep house music, but the music I listen to a lot is Dub Reggae. Scala at Kings Cross is good. It's crazy baselines and slow beats.